Microsoft announced today that Access Services in SharePoint are slowly going away in favor of Microsoft PowerApps! Starting in two months (June 2017), you will no longer be able to create Access-based apps in SharePoint Online, and you have until April 2018 to convert your existing Access apps to PowerApps or any other tool that fits your business needs. To make the transitioning process smoother, Microsoft has added a feature in Office 365 allowing you to export your data from the Access app, to a SharePoint list from where you can take advantage of both PowerApps and Flow to build modern and mobile-ready business applications. You can find more information about the process here. As for everyone who is running SharePoint On-Premises, not only will Access Services and Access Web Apps be supported for the remainder of your current SharePoint support timeline, but they will also be included in the next version of SharePoint Server! For all those of you who think that SharePoint 2016 is the last version of SharePoint On-Premises, this blog post is another proof that there will be another version of SharePoint Server . An important note is that this does not affect the Desktop version of access, but simply Access Services in SharePoint! I am wondering, how many of you use Access Services in SharePoint Online currently? If you use it simply type something in the comments! 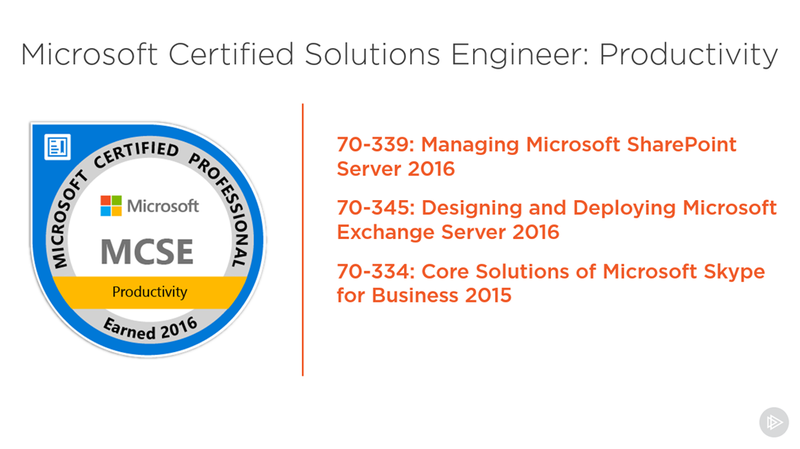 You can find the Original Announcement on the Microsoft Tech Community! When creating a new Site Collection by PowerShell, we have the option to apply the Site Template Directly, however you must know the Template ID for that site. For example you will need to give PowerShell the #STS1 to create a team site. Here is the SharePoint 2016 Site Template ID List for you to use in your own PowerShell scrips. This is really all the available templates, however some of them are obsolete (as marked in their description), so do not use them. New-SPSite http://www.contoso.com -OwnerAlias "DOMAIN\jdow" -Name "Contoso" -Template "STS#0"
Service Accounts are a very big part of installing every version of SharePoint, however everyone has a different way of setting them up. And once you install your SharePoint with a set of service accounts, it’s not always easy to change them. Let’s take a look at the SharePoint 2016 Service Accounts that I reccomend. Every SharePoint administrator you ask, will have a different opinion on how many service accounts you need and whether you should have dedicated service accounts for some Service Applications or certain administration tasks. Even if all SharePoint Administrators have different opinions, it doesn’t mean some are wrong and some are right, there is no real “golden” solution that will be good for every SharePoint farm out there. From my experience with SharePoint, here are the Service Accounts that I recommend for your SharePoint 2016 implementation. The following Service Accounts can be named according to your companies naming convention. Local Security Policies only need to be configured if you have Group Policies that will take those away. This account will be used to Install and configure the SharePoint farm initially. After the initial setup, you can grant the farm administrator rights to your SharePoint Administrators account so they can log in and manage SharePoint with their own account. Runs the Application Pool for most of your Service Applications. There are some service applications that require more rights and a dedicated Service Account is recommended. We’re converting those a bit lower in this blog post! Runs the Application Pool for your Web Applications. The Default Content Access Account for the Search Service Application. This account is sued to crawl the content of your SharePoint Web Applications. Object cache account (Super User). Must not be an account that will ever be used to log in to the site. Object cache account (Super Reader). Must not be an account that will ever be used to log in to the site. The following Service Accounts are recommended for your dedicated SQL Server hosting SharePoint databases and can be named according to your companies naming convention. Local Security Policies only need to be configured if you have Group Policies that will take those away. This account will be used to Install and configure the SQL Server initially. 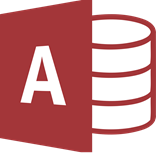 After the initial setup, you can grant the SQL Admin rights to your SQL Administrators account so they can log in and manage SQL with their own account. This account would be used as the RunAs account for the Workflow Manager and Service Bus Farms. If you want, you could create a dedicated account for each. 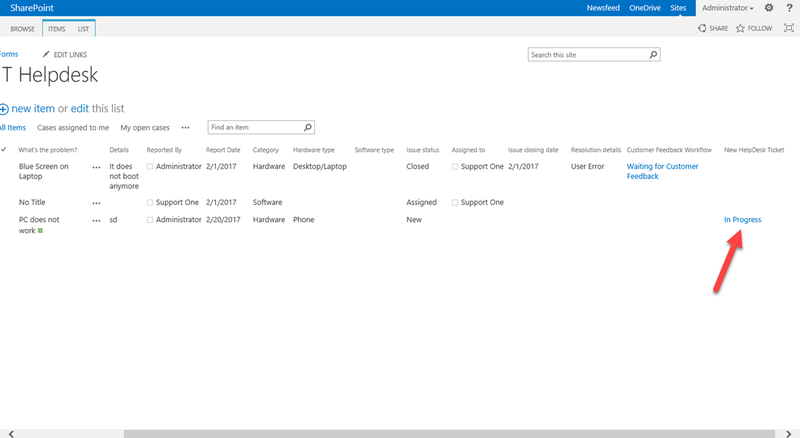 The IIS Application Pool running the Access App Services Service Application needs to have “Load User Profile” at True. Navigate to the IIS Application Pools , and from Advanced Settings, change “Load User Profile” to True. The PowerPivot unattended data refresh account is a designated account for running PowerPivot data refresh jobs in a SharePoint farm. Whatever accounts you choose, here are some recommendations that you need to follow for your SharePoint 2016 service accounts. First of all, the length of your Service Accounts Username should be less than 20 (including domain name). This is due to the SAM-Account-Name attribute (also known as the pre–Windows 2000 user logon name) which is limited to 20 characters in the AD Schema. For example, CORP\SP16Prod_SuperReader is 25 characters and would be too long. My second recommendation is to use different service accounts for each environment. For example, your production might have a SP_Services, while your QA account would be SPQ_Services. This makes sure that nothing in a farm can affect the other one, and if you ever want to test for example changing the password of the managed account, or giving the password of the QA account to someone else, you will not compromise the security and stability of your production SharePoint farm. One of the benefits of SharePoint is to make it easier for users to do their day to day tasks, and to automate as many processes as possible. While SharePoint allows developers to create advanced workflows and custom actions, Business Users that do not have a deep knowledge of SharePoint are often left powerless and do not customize their SharePoint experience to make them more productive. Luckily, the Microsoft partner ecosystem stepped up and created a lot of solutions to add features on top of SharePoint and allow business users to get the most out of it. In this blog post, we will talk about KWizCom Custom Actions. KWizCom Custom Actions, part of KWizCom Forms (Ent. edition) enable non-technical users to implement their required use-cases, without having to deal with technical workflow tools. These implemented business scenarios can include a mixture of automated activities with manual user input. For this review, I have logged in a KWizCom demo environment that has some built in lists so we have some content to play with. One of those lists is a IT Helpdesk list, so let’s see what we can automate and make easier for our users. KWizCom Custom Actions allow us to create both List Custom Actions, as well as Item Custom Actions. 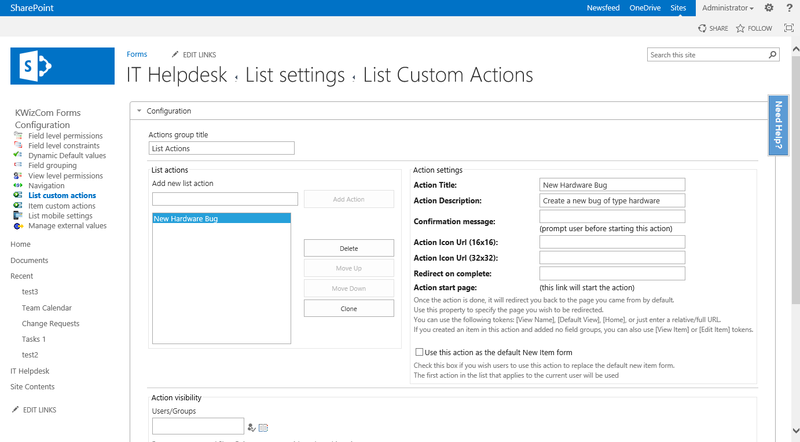 List custom actions allow us to create custom actions at the list level, such as “Create a new Hardware Bug”. The Item Custom Actions apply to a certain item only for example “Assign Ticket to Me” and this will be displayed in the context of a ticket only. My goal on what to create is a custom action, that will create a New Hardware Bug, and only show me the fields about the Issue Details. Since I am submitting a support ticket, I don’t have any information about the Issue Resolution Details yet. So, let’s see how we can build it. First, I will go to the List Custom Actions settings page, and add a new Custom Action. As you see I can enter the Title, a Description (which is displayed as a tooltip when hovering over the custom action in the ribbon), a confirmation if I want my user to confirm before activating the custom action as well as a custom icon for my custom action, so it’s easily recognizable in the ribbon. I can also redirect my user to for example the Edit Item view of the item I am creating, or to a different view. Lastly, I can use KWizCom Custom Actions to overwrite the “New Item” button from the ribbon. If I would select that checkbox, every time someone would click on New Item, it would activate this Custom Action and do whatever I will configure this Custom Action to do. A bit lower on the page, I can choose to whom this action will be visible. For example, I have selected below that this action should only be visible to the users that are part of the Helpdesk Customers group, and create a new List item and automatically update the field Category to Hardware. Also, don’t show me all the columns, but only the “Issue Detail” field group, because when I open a new ticket, I don’t need to see/enter information about the resolution. Lastly, KWizCom Custom Action allows me to start certain workflows after a custom action is done. 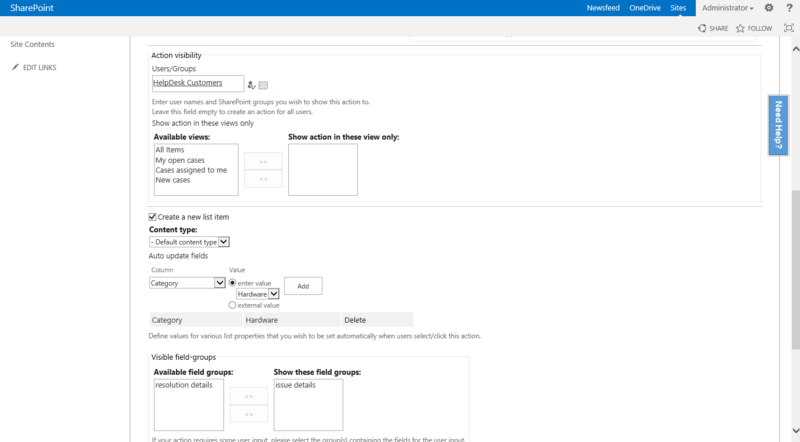 By Default, with SharePoint Designer, I can start a workflow when an item is created, modified or manually start it. With KWizCom Custom Actions I can start a workflow automatically after running a certain action on an item. Maybe opening a hardware bug, a software bug and a change request shouldn’t all trigger the same workflow. When clicking on the New Hardware Bug Custom Action, I have a form that only displays the issue Details group as we wanted it to, the category is Hardware, and since we told our Custom Action to auto-update it, as you see it doesn’t even show up on the columns we need to fill. This make sure that the maximum number of information is filled in by the Custom Action, and users only see the relevant columns they need to enter information on. The less time they will spend on filling this form, the more time they will have to be productive. 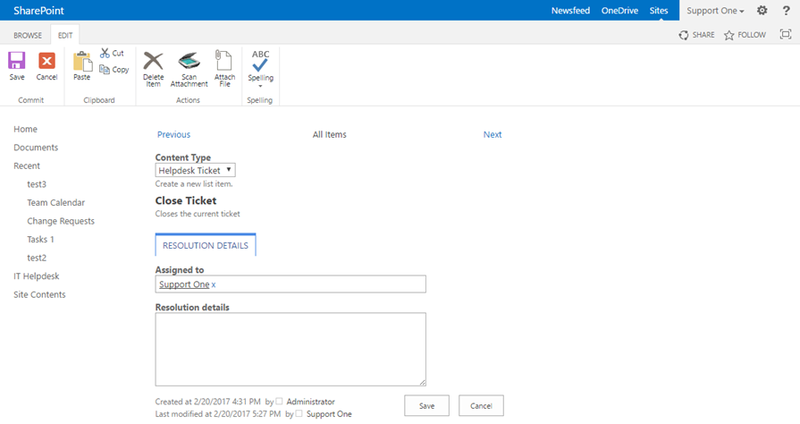 After entering the information and clicking on Save, the item got created and the new Helpdesk ticket workflow started! Pretty awesome! Now let’s take a look at an Item-level Custom Action. For example, let’s create a Custom Action that would “Close Ticket”. The goal of this action would be to close the ticket, and only show the helpdesk technician the information needed to close the ticket such as Issue Resolution. Furthermore, this custom action should only be visible to tickets that are in progress, and that are assigned to the Helpdesk technician currently looking at the ticket. Let’s go to the Item Custom Actions settings page and create a new custom action. We will enter a title, a description as well as a confirmation ticket to make sure that Helpdesk technicians really want to close the current ticket. I could set this action to overwrite the default Edit Item form, but I don’t want to in this specific business case. We will then enter the Action visibility criteria. We want to make this custom action only visible to Helpdesk technicians part of the Support Active Directory group. Furthermore, it should only be visible when the issue status is assigned, and when it’s assigned to the Helpdesk technician currently opening the list item. Note that even if everything worked perfectly, it seems that the [Me] in the people picker has an error, but everything worked, so it must be a small UI error. Next up we need to decide what this custom action will do. We will edit the list item, change the Issue status to Closed as well as the Issue closing status to [Today]. I really like the fact that KWizCom Custom actions supports tokens such as [Me] or [Today], it truly makes custom actions more dynamic. Next up, we only want to show the Resolution details field group, because no use in seeing the issue details, then switching to the issue resolution tab to enter the required information. When we close a ticket, we simply want to enter the information about the resolution and that’s it. Lastly, I will start a Customer Feedback Workflow. 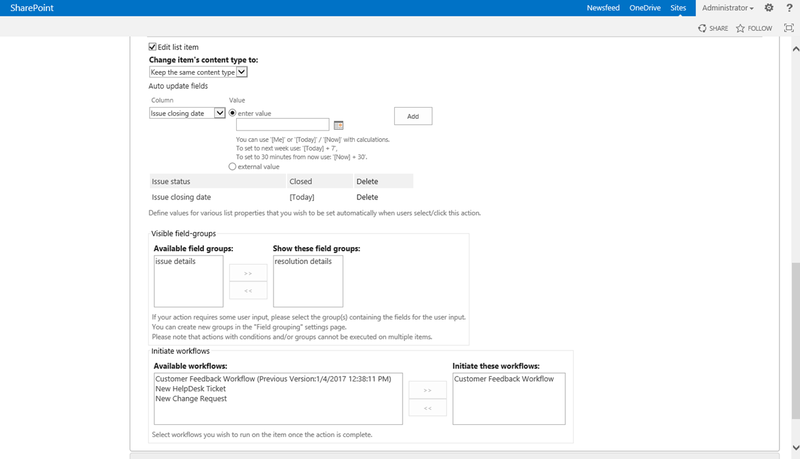 This is a great example where I could not really have done this without the Out of the Box SharePoint Designer workflows, because an item might be edited 50 times before being closed, so I would have had to left this workflow at “Manually Started”. With this custom action, I know that every time a Helpdesk Technician closes a ticket using this custom action, not only will they only see the required fields and save them a few clicks every time, it will also automatically start the correct workflow. Something that I realized is that in the Available Workflows, it seems that all workflow versions are displayed in the KWizCom Custom Actions version I tested, even older versions of a workflow. If a workflow has been edited a lot, it might appear multiple times in the Available Workflows box with a (Previous Version #date) near it. So now I will go to one of my ticket and let’s look at the result. I logged in with a user in the Support group (Support One) and assigned the ticket to that user. As you see, the Close Ticket Custom action appeared in my ribbon under Item Actions. Now when I click that Custom Action, I will first have to confirm that I really want to do that. This pop-up is displayed because we have set this text as confirmation earlier, when configuring the Custom Action. Once we click on OK, we will have to enter the missing information needed to close the ticket, so the Resolution Details. We didn’t have to change the Issue Status, or specify the Closing date because all those are automatically managed by the Custom Action engine. The ticket is now closed, and our Customer Feedback Workflow has been started! Pretty awesome time saver to be able to click one button, and have all this done for you. Another thing that I can do with KWizCom Custom Actions is bulk change items. For example, I have a task list, and I create a custom action called “Assign to me”. The goal of this Custom Action is to have a button to assign a task to myself, so I don’t have to edit the task, choose myself from the people picker, and save it. I entered a Title and Description, and I specified the Redirect on Complete to go to the “My Tasks” View. This way, after I assign myself to a task, I will go to the view where all my tasks are. What this Custom Action will do is change the “Assigned To” field to myself, the currently logged in user. After clicking Add, in this version of KWizCom Custom Action I see that the people picker displays a little error, however everything was successfully added. Now let me go back to my list and test it out. The beauty is that with Item Custom Actions that require no Input, I can run them on multiple items at once. By default, when running a Custom Action on multiple items you need to confirm it. Once you click on OK, it will take a few seconds to run this on multiple items, but you will see the progress in real time. Finally, I was redirected to the My Tasks view, and as you can see both tasks have been assigned to me! One click on the custom action and it saved me about 10 clicks! In this blog post we have reviewed KWizCom Custom Actions, which is part of KWizCom Forms (Enterprise Edition). KWizCom Custom Actions allow us to create Custom Actions (buttons in the ribbon) that will do multiple things, with a single click. In this blog post we have seen how to create both List Custom Actions as well as Item Custom actions that allowed us to create items, or edit them and fill in most of the details that we needed automatically. Furthermore, KWizCom Custom Actions allows us to only display Custom Actions to certain people, or in certain cases with dynamic conditions. I found KWizCom Custom Actions to be really easy to use and without having to read the documentation, I was able to create some pretty cool Custom Actions! If you’re looking to allow your business users to create powerful custom actions without the need of a developer, definitely check out KWizCom Custom Actions by clicking on the logo below!